Gout is a type of arthritis that causes sudden attacks of pain in the joints, often attacking the big toe. Although it is more common in men than in women, gout can also affect women, especially after they enter menopause. Some types of food may increase your risk for suffering from gout or make it more likely you will suffer from an attack of gout if you already have this condition. 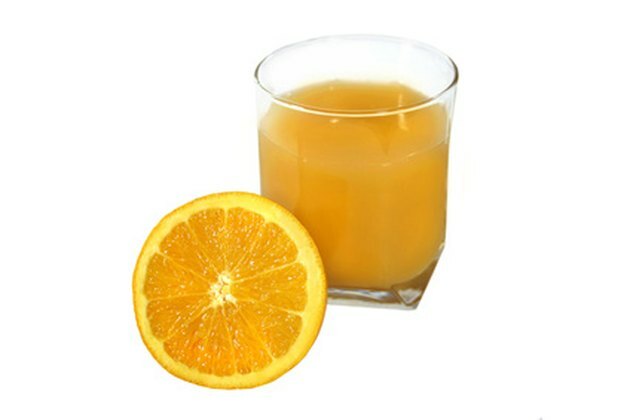 Drinking at least one glass of orange juice per day may increase your risk for developing gout, according to a study published in November 2010 in the "Journal of the American Medical Association." Study participants who drank two or more glasses of orange juice or sugar-sweetened soda were even more likely to develop gout. These drinks may increase levels of uric acid in the blood, causing this increased risk for gout. Overall, consuming a diet low in seafood, organ meats, beef, pork, lamb and alcohol that contains low-fat dairy, whole grains, lean protein, fruits and vegetables and at least eight cups of fluid per day may limit your risk for gout attacks. If you are overweight, losing weight may also limit gout attacks since it can lower the amount of uric acid in your body. Eating foods that increase uric acid in your blood, such as orange juice and foods that contain purines, a natural substance that breaks down into uric acid, may increase the chance you will suffer from gout attacks. Gout is caused when excess uric acid in the blood forms crystals around your joints. These crystals cause the inflammation and pain associated with gout. Orange juice is healthy in moderation, and you shouldn't necessarily stop drinking it altogether as a result of the possible increased risk of gout. The overall risk of women developing gout is very low, so even if you drink orange juice regularly it won't make your overall risk for developing gout very high. Less than 1 percent of women in the "JAMA" study developed gout, for example. How Many Calories Are in Cherry Vodka?